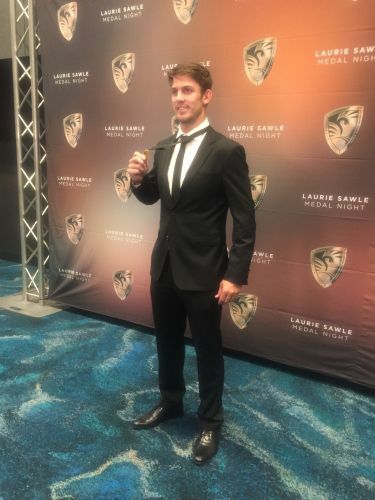 Laurie Sawle Medallist Mitch Marsh. MITCH Marsh won the 2018 Laurie Sawle Medal ahead of his brother Shaun Marsh who was second and third-placed Cameron Bancroft who attended the annual awards night held at Optus Stadium last night. The Fremantle District Cricket Club player, who will have surgery on his ankle next week, said 2018 had been the greatest year of his life so far. He said it had been a huge honour to captain WA, a team he had been part of for nine years. Elyse Villani won the 2018 Zoe Goss Medal ahead of Nicole Bolton who was second. “It was a surprise, we had strong performers throughout the season,” Villani said. Throughout the night, award winners and speakers acknowledged the strength of the WA Cricket Association (WACA) “family” that players and staff had drawn on over the past few weeks since the ball tampering incident. WACA chairman Ken Michael said it had been a challenging two weeks “where lessons have been learned”. Michael said they now needed to work on regaining the support of the cricket public and commended chief executive Christina Matthews on the “sensitive, compassionate and engaging way” she had managed the difficult situation. “Tonight is about celebrating and we do have much to celebrate,” he said. WA coach Justin Langer acknowledged Michael Klinger who has retired from Australian first-class cricket. Klinger, who attended the awards with wife Cindy who is battling cancer, said he would still play for the Perth Scorchers and would consider coaching in the future.